It’s 11:08a.m. on Sunday, October 26. Barack Obama has just started his speech at the rally in Denver and APL is there watching him. Unfortunately, I’m at home in bed even though I would have really liked to go. But just like the weekend we went to see the aspens changing, I was forced to recognize this morning that I had passed my tolerance point. Despite not being able to go to the rally, I have had a wonderful weekend. On Friday afternoon, my friend RK (a.k.a. Judice) and I made caramel apples at RK’s house while our puppies played in the pasture. The caramel apples turned out to be a lot easier than we expected, and we really enjoyed making them. Then both our boyfriends came over and we made some pasta and garlic bread for dinner and we all watched a movie. It was a really relaxing and fun way to spend a Friday. On Saturday afternoon, APL and I went with a bunch of friends to a local farm that had over 100 acres of pumpkin fields. Pumpkins as far as the eye could see! It was amazing! And it was a gorgeous, sunny, fall afternoon. 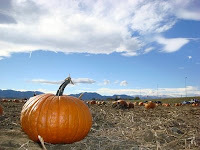 We wandered through the fields until we all found the perfect pumpkins – some of our friends even found several! Then we bought some pumpkin bread and orange soda and lost ourselves in one of the farm’s corn mazes for a while. We also picked up some of the most alien looking gourds I have ever seen. We bought the pumpkins in preparation for our third annual pumpkin carving party, a tradition APL and I started when we moved to Boulder. Unfortunately, by the time it was time for the party that evening, I was already exhausted from spending the afternoon at the farm. I decided that achy hands + slippery pumpkin guts + knives = not such a good idea. So I didn’t end up carving a pumpkin this year. But I did enjoy hanging out with my friends while they carved their pumpkins. I watched a little bit of Army of Darkness, which we had playing on a loop in our living room, and ate a caramel apple. And the end result this year was awesome! We had sixteen pumpkins and they looked incredible all together. We spent some time just sitting in the glow of the pumpkins in the living room. I really enjoyed it. Of course, by the time most of the party left and my closest friends helped us clean up a little bit, APL & I went to bed well after midnight. We were planning to get up early to catch a bus to Denver to see the Obama rally, so I was already nervous that I wasn’t going to get enough sleep. I don’t know if my nervousness kept me awake or what, but I hardly slept at all. It took me an hour or more to fall asleep in the first place, and then I kept waking up. I tried everything I could think of to make myself more comfortable so I could sleep. I put socks on. 1:54 a.m. I got up to go to the bathroom. 2:15 a.m. I got a drink of water. 3:04 a.m. I turned the fan off. 4:39 a.m. I tried a new pillow. 5:55 a.m. No luck. Needless to say I was less than thrilled when the alarm went off at 7:00 a.m. Also, all the wandering around at the farm yesterday had left my feet feeling like someone had run over them with a steam roller, which didn’t bode well for walking the twenty or so blocks from the bus station in Denver to the park where the rally was taking place. When I told APL how I was feeling, his immediate response was not “we don’t have to go” but “you don’t have to go.” It made me feel sad that my body was so uncooperative and also that I can be such a burden on APL. Even though I really wanted to go to the rally, when I really thought about how I was feeling I realized that I would only be a drag on APL and his friends if I tried to push myself to join them. I’m exhausted, I would have trouble walking, I wouldn’t be able to stand around for very long, and APL would have to take care of me instead of enjoying himself. So APL met his friends and caught the bus to Denver without me, and I, mercifully, actually got a little bit of sleep after he left. When I woke up again I felt, if not better physically, at least a little less sad. I did have a really wonderful weekend otherwise. And I really am supposed to be resting, not running around like I have all the stamina in the world. I have to pick my battles, I guess, and this weekend I picked friends and pumpkins. Sorry about that, Obama. Guess you’ll have to make do with 99,999 supporters today. For the record, I would always rather you be there than not. Always. I would have carried you today. I am glad that you are picking and choosing your battles. It is such a hard thing to do. Just know that you are never a burden on anyone. Never. Ever. Don't let yourself feel that way. In my opinion, a day with you around is a day much better spent! Thanks, guys. Don't know what I'd do without you.